The first time I heard about eggnog was during my late teens, and that was actually not too long ago. *coughs* Back then, I picked up this pretty looking carton and “EGGNOG” was written right across it. It seemed interesting and I wanted it till I noticed that it actually costed 10 bucks for a carton? Hell no, that was like my lunch money for 5 days at the school canteen. I scanned through the ingredients and noticed eggs and rum among the elements. I thought it was weird. Eggs and rum in a drink? No judging allowed. I was in my teens remember? Now that I am a leeetle bit older and I have Uncle google as my bestfriend, I know that Eggnog is basically a sweetened dairy beverage that is made from milk, cream, sugar and eggs. It is also often flavored with alcohol before finishing it off with a dusting of cinnamon or nutmeg and at times a mix of both. The origins of eggnog are very debatable and therefore I wouldn’t want to feed you guys with the wrong information. 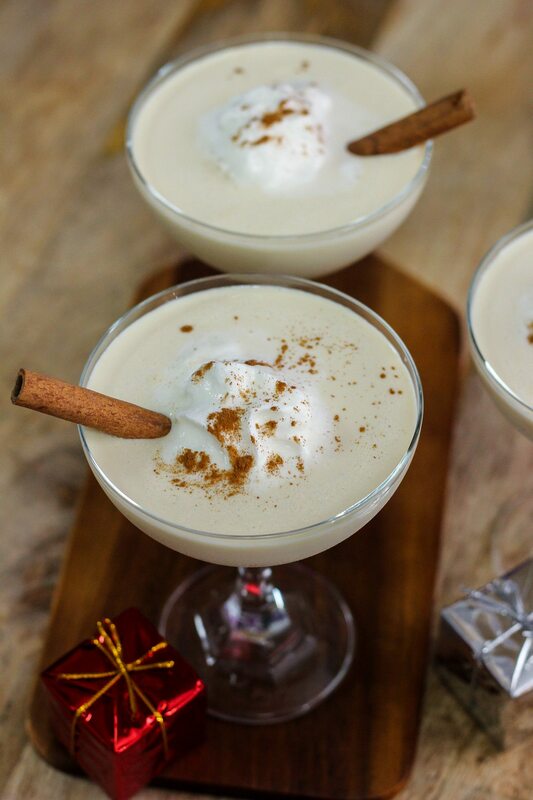 Let’s simply say that Eggnog is traditionally consumed throughout Australia, United States and Canada during Thanksgiving and Christmas seasons. Since we do not consume alcohol, (Read: My family and I), I would make non-alcoholic eggnog instead. 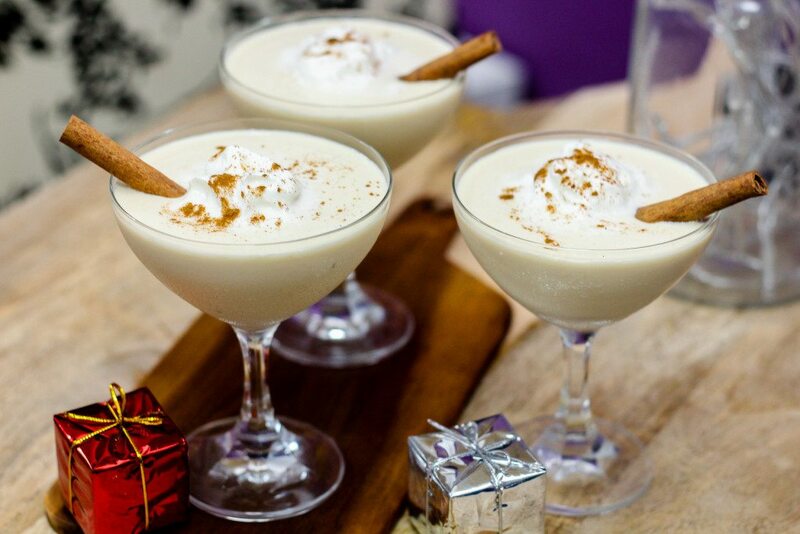 Making eggnog is actually really simple. 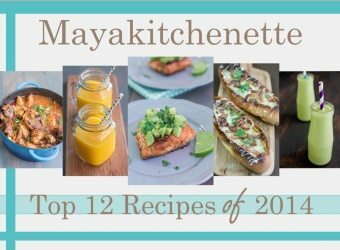 It uses basic ingredients which you would have most likely have them sitting in your pantry/fridge. I do not like the idea of consuming raw eggs and I would pasteurize my eggs when I make eggnog or Tiramisu alike. Although I used regular cane sugar to sweeten this eggnog, you can basically use any sweetener you prefer like maple syrup, stevia, raw sugar..etc. 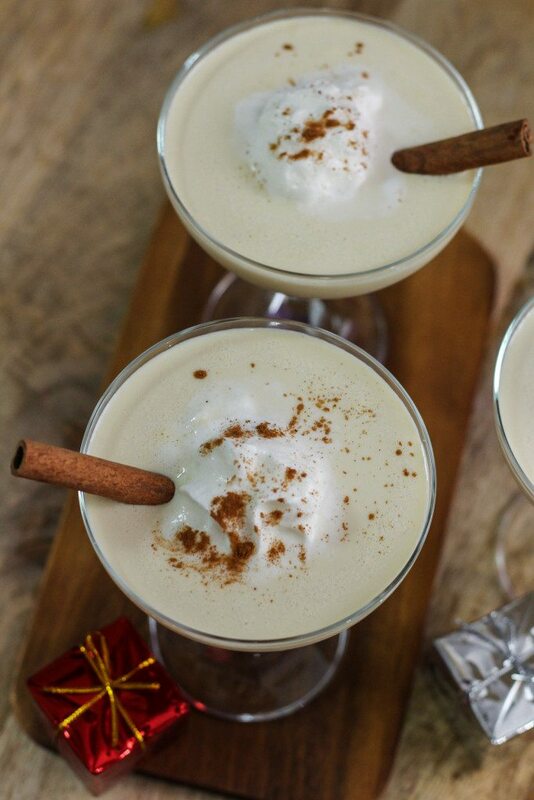 If you have never tried this iconic Christmas drink before, it would be the perfect time to give this eggnog recipe an attempt this year. You’ll be blown away by the goodness of this decadent and extremely smooth non-alcoholic eggnog, I promise. This classic drink is also perfect to keep out the winter cold. Add the cream, milk, cinnamon, clove and nutmeg in a saucepan and bring it to a gentle simmer. Meanwhile, in a bowl, whisk egg yolks and sugar until the mixture doubles in volume and it’s a nice pale color. Slowly add about 1 cup of the hot milk mixture into the egg yolk mixture, making sure to constantly whisk. Add the egg yolk mixture back into the saucepan with the remaining liquid and cook stirring constantly until the mixture is forming little bubbles at the sides. It should almost come to a boil but not a full boil. Strain the mixture through a fine sieve, add the vanilla and mix well. 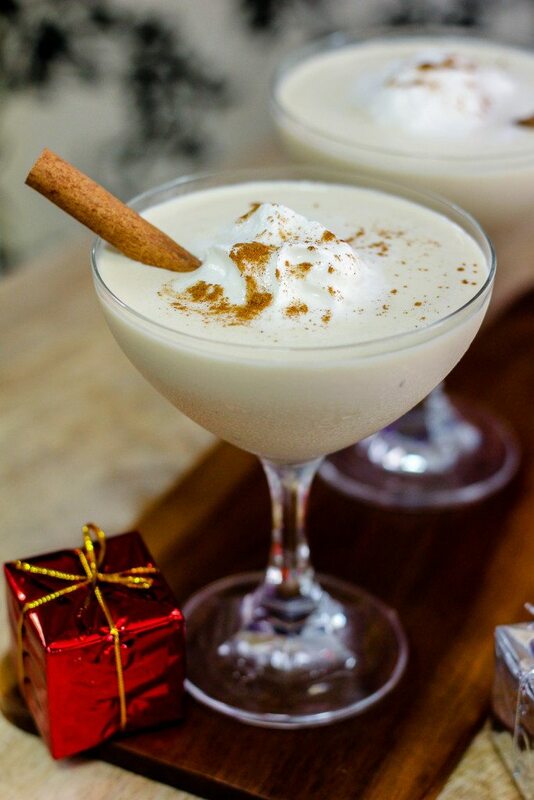 You can serve this hot but I personally love it chill so I would keep the eggnog in the fridge for a couple of hours. Serve with a nice dollop of whipped cream and a pinch of cinnamon.